If you've read Emery Lord's debut novel, Open Road Summer, then I'm sure her follow up novel has already been added to your to-be-read list. But for those who are new to this woman's writing, I strongly recommend getting acquainted with her brilliant and beautiful story-telling. The Start of Me and You has a slow build, introducing the reader to Paige: a teenage girl who is grieving the loss of her boyfriend, while still navigating the trials and tribulations of high school life. Chapters flew by and I found myself completely surrounded in Paige's world. Her best friends were the type of friends I remember from my own childhood. They are that group of girls who would drop everything to be by your side in an instant, even if the moment just calls for ice cream and lattes. The relationships Paige has with her family felt very authentic and fleshed out. Emery Lord has the ability to create characters breathing through the pages. These aren't just fixtures in a story, they are pulses vibrating from one page to the next. And then there's the boy. He isn't your typical crush that we see so often idolized in YA contemporaries. I appreciated the realistic approach that Emery Lord took in creating this character and cultivating the relationship between him and Paige. The atmosphere sizzled between these two characters, only to cascade into a finale of all finales. There was total book clutching happening as I read that last chapter. Emery Lord is a delightful person who has graced the YA contemporary world with a gift of irreplaceable and unforgettable story-telling. The Start of Me and You is a book not to be missed. If it hasn't already been added to your to-be-read list for 2015, please make a point to add it now. I adored this story in countless measures, reminding me why I fell in love with literature to begin with. About the book from Goodreads: Following her pitch-perfect debut Open Road Summer, Emery Lord pens another gorgeous story of best friends, new love, & second chances. I haven't actually read anything by Emery Lord but I recently found her on Twitter and fell in love with her voice. Now I REALLY want to read Open Road Summer... 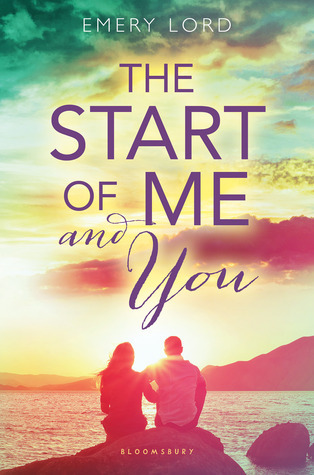 I also can't wait for The Start of Me and You but since that's not out yet I think I'll be jumping into ORS soon! I haven't read anything by this author but it sounds interesting! Great post! I haven't read either of Emory's books but I NEED TO. I absolutely loved The Start of Me and You! Emery managed to write another amazing contemporary story, and I was so, so, so completely moved by it. I'm so glad you enjoyed it too!